You may have heard about the new book scanner purchased by the APRL, thanks to the generosity of the members of the Mighty Buck Club. Here’s an example of what the scanner can do. We had to do a little rearranging in the library to make room for the new scanner. We moved our microfilm reader to a different spot in the library, and in doing so, a joint publication of the APRL and the National Archives and Records Administration came to my attention. I had been looking for a small digitization project to show off our new scanner, and this publication seemed to fit our needs perfectly. First, it is a publication of the APRL, and one of our top priorities for digitization is preserving and making available the history of the APS and APRL. Second, it is a finding aid, which can be used by researchers to learn more about resources in our collections (in this case, the Stamp Bill Books which were microfilmed with funding from the APRL). If you don’t know about the Stamp Bill Books, read the pamphlet to learn more about this valuable resource! Third, as a publication of the U.S. government, it is in the public domain and free from copyright restrictions. Fourth, it is short (6 pages), not requiring extensive staff time or large amounts of storage space – perfect for a test. One of our APRL volunteers took a few minutes’ break from another project and scanned it for us. To view the document, go to our Online Catalogue and search for “Stamp Bill Books” in the title field. You should see two records: one for the microfilm, and one for the book describing the microfilm. Click to view the full display for the book, and you will find a link to the digitized book. The PDF file is fully searchable, thanks to text recognition software built into our new scanner. Watch for more from our new scanner – and remember that if you want to see what our new scanner can do for you, you can request scans of articles and book sections from the APRL. It is National Train Day and a good opportunity to comment on railway mail service information resources. Most of our philatelic libraries including the American Philatelic Research Library have books and periodicals relating to the railway mail service. The Railway Mail Service Library (RMSL) in Boyce, VA is a virtual treasure trove of research materials and artifacts related to the railway mail service. I wrote a previous blog post on the RMSL. The Mobile Post Office Society is devoted to the study of mobile mail including railway mail, and has several publications on this topic. 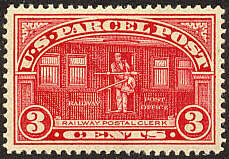 The National Postal Museum of the Smithsonian Institution has a section of its website devoted to the railway mail service. It also has an online exhibit titled “Mail by Rail”. One of the museum’s most popular exhibits is about Owney, the dog that served as the mascot of the Railway Mail Service. Searching the Hathi Trust Digital Library, an enormous collection of online digitized publications, using the term “railway mail service” links to a number of publications, many in full text. The National Archives has indexes to rosters of railway postal clerks from 1883 to 1902. Happy National Train Day. Bruce Marsden, APRL Board Member and Librarian for the New York Collectors Club Library, reports the posting to the Collectors Club’s website of the first scanned copy of a rare, out-of-print, publication from its collection. The library has posted the 1842 first edition of Messr. 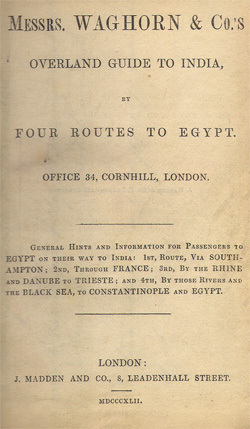 Waghorn & Co.’s Overland Guide to India by Four Routes to Egypt [pdf]. The library’s catalog notes indicate that this may be a unique volume and it is the predecessor to the 1846 second edition owned by Oxford’s Bodleian library which is available online through Google Books. Marsden indicates that his first reaction on finding it on the library’s shelves was to question why the library would have an early travel guide, but he learned that Thomas Waghorn’s real claim to fame was the opening of the route which shortened the time the post required to journey between England and colonial India. Prior to establishing an overland link from Alexandria to Suez, mail and passengers from England to India had to travel around Cape Horn, a much longer and riskier journey. Marsden encourages everyone to take a look at the Collector Club’s first experiment in the online distribution of a digital publication. Feedback and suggestions are invited. The Philatelic Literature Review (PLR) is the official publication of the American Philatelic Research Library (APRL), but it predates APRL by many years. In 1942 Daniel W. Vooys organized the Philatelic Library Association, and PLR was the official publication of that organization. Vooys edited PLR from 1942 to 1956 and again from 1963 to 1970. The early issues of PLR are divided into two series, one running from 1942 to 1949 and another from 1950 to 1970. In 1970 the Philatelic Literature Association merged with APRL, and it was at that point that PLR became a publication of the APRL. Charles Peterson was the first editor of PLR under the auspices of APRL. Vooys was instrumental in the founding of APRL and donated most of his personal collection to the library. In memory of Vooys, the APRL has established the Daniel W. Vooys Fund, and those who contribute $5,000 to the fund become Daniel W. Vooys Fellows. 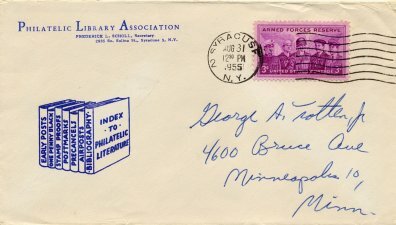 The 1955 cover above with the Philatelic Literature Association corner card is one of several in my collection. It contained a promotional piece and membership application for the Association. It read in part: “Membership in the Philatelic Library Association and subscription for the Philatelic Literature Review costs only $1.00 a year. There are no elaborate rules, no initiation fees, or other obligations of any kind. Everyone interested in stamp collecting in any way is sure to find the Association helpful in their activities. There is no better time than NOW to become a member.” A subscription to the current PLR is $18, but you are still sure to find it helpful in your philatelic activities. The APRL recently received a donated box of greeting cards from the first half of the 20th century. Most of them are Christmas cards, but among them are several valentines. To celebrate Valentine’s Day, I thought I would share a few images of these cards with you. Click on the small images in this post to see larger images. The first image is a valentine with a postal theme – natural, given that many Valentines were mailed to the recipients. This one is printed on folded card stock with a heart-shaped cutout. 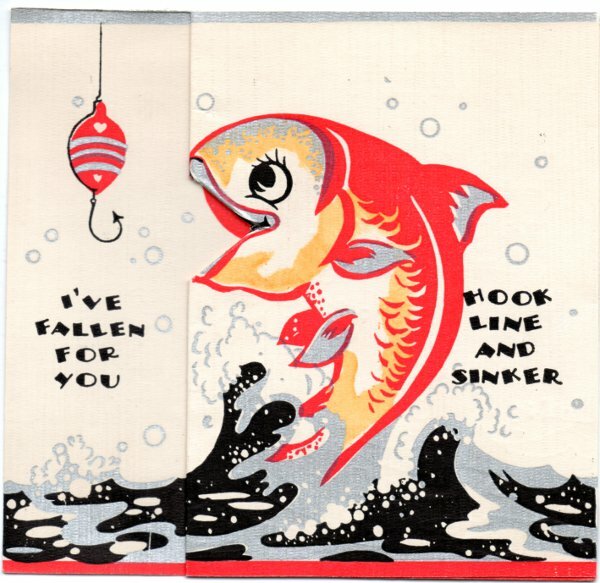 The second image is a card made by Hall Brothers, which later became Hallmark. It features a fish on the cover and opens to reveal another fish with a three-dimensional mouth. Because most of these cards have been removed from their envelopes, it’s difficult to guess the year they were made. 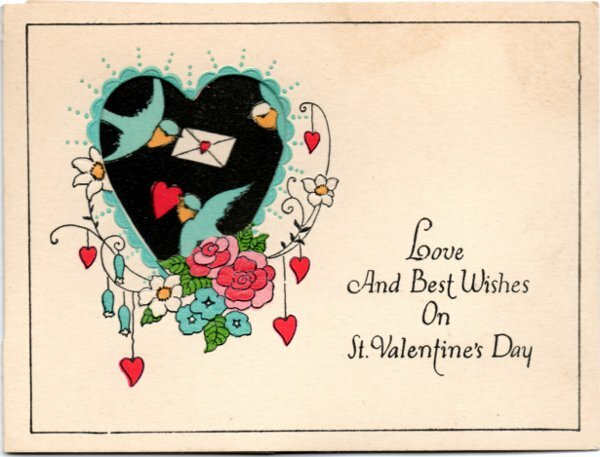 However, given the name “Hall Brothers” printed on the back of this card, we can deduce that it was produced between 1915, when the company began producing greeting cards for Christmas and Valentine’s Day, and 1928, when the company began using the name “Hallmark” on the back of its cards (Hallmark Cards, Inc., 100 Years of Hallmark History). 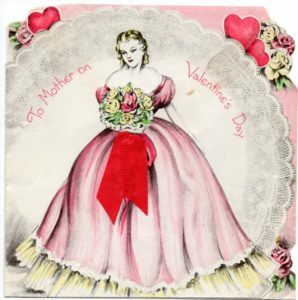 Of course, February 14 always brings to mind love stamps, and the Smithsonian National Postal Museum posted a gallery of love stamps on its Facebook page today. The APRL would like to send some Valentine’s Day love out to everyone who donates special collections like these cards to us, and to Scott Tiffney, a new volunteer who took a break from a book cataloging project to sort through the box of cards and organize them by subject. Most of the cards are from the U.S. and Japan, but other countries are also represented, and some are still in their envelopes. What could be more fitting than a former railroad station serving as the home of the Railway Mail Service Library (RMSL). The RMSL is located in the historic Boyce, Virginia railroad station. According to the mission statement on its website the RMSL “is an archival collection of primary and secondary sources pertaining to en route distribution history. It also features many obsolete postal artifacts associated with this activity. These items are used to assist researchers interested in route agent, seapost, railway, and highway post office (RPO and HPO) operations, known as the Railway Mail Service/Postal Transportation Service (RMS/PTS).” The RMSL has every major book published about RMS/PTS. The library includes six types of original-source documentation in its collection: 1) photographs of HPO and RPO vehicles; 2) The Railway Post Office and Postal Transport Journal issues between 1905 and 1959; 3) oral recollections of former clerks on audio and video tapes, as well as movies about the RMS/PTS; 4) general orders describing weekly changes within several divisions; 5) general and standpoint schemes of mail distribution; and 6) schedules of mail trains/routes. These schemes and schedules are helpful in understanding how the network of mail transportation and distribution activities operated, as well as when routes began, ended, or underwent significant changes. The RMSL and its predecessors date back to the early 1950s, but it was incorporated in its current format in 2003. Frank R. Scheer is the Curator and driving force behind the RMSL. Scheer routinely makes presentations at meetings and events related to railway mail service around the country. Scheer can be contacted at f_scheer@yahoo.com . The railway station housing the RMSL appeared on a special postmark (shown above) for the centennial of the Town of Boyce in October 2010. Postal Employees After Hours is a new website from the Smithsonian National Postal Museum about the group activities of postal employees outside of work, including sports, musical groups, and charity work. The website includes activities discovered during research in the summer of 2010 but is not exhaustive. The museum welcomes information about other groups and activities, both historical and contemporary. 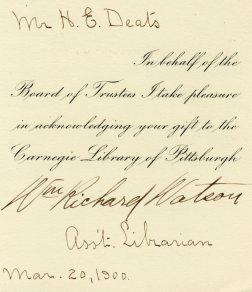 My recent post about the Thomas Hales Collection of Civil War Patriotic Envelopes at the Postal History Foundation of Tucson, Arizona reminded me of a collection of Civil War envelopes at the Library Company of Philadelphia. That collection of Civil War envelopes is part of the John A. McAllister Collection of Civil War Era Printed Ephemera, Graphics, and Manuscripts. It consists of about 7,000 patriotic envelopes. As with the Thomas Hales Collection, most of the envelopes in the McAllister Collection are representative of the Union side of the Civil War. A collection of around 300 of the envelopes are displayed as part of the Library Company’s online digital collection. The documentation of the McAllister Collection envelopes also makes use of William R. Weiss’ The Catalog of Union Civil War Patriotic Covers (Bethleham, Pa.: William R. Weiss, 1995). The Library Company of Philadelphia is the library founded by Benjamin Franklin in 1731. Paul Nelson of the Postal History Foundation of Tucson, Arizona has contacted me in regard to an extraordinary donation of patriotic envelopes to the Foundation. 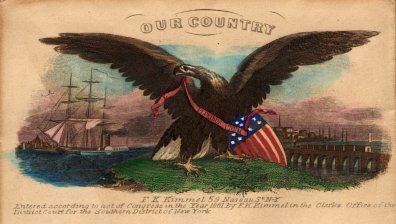 It has received the Thomas Hale Collection of Civil War Patriotic Envelopes which consists of approximately 2000 different historic and colorful pieces of stationery. According to Paul, all are unused envelopes and most are from the Union states, although there are a few with Confederate designs. He indicates that the freshness and brightness of this group of patriotic envelopes is unusual. The collection has been stored for years in a family trunk. Many of the covers are hand colored and all are essentially in mint condition. The covers have been organized in the Foundation’s library based on the categories that were published in The Catalog of Union Civil War Patriotic Covers, by William R. Weiss (1995). With 2011 being celebrated as the 150th anniversary of the beginning of the Civil War, and with the recent release of a new book, Patriotic Envelopes of the Civil War: The Iconography of Union and Confederate Covers by Steven R. Boyd, the subject matter of the Thomas Hale Collection should be of interest to many historians and philatelists. The Thomas Hale Collection of Civil War Patriotic Envelopes is available for study by appointment. Contact the librarian, Charlotte Cushman, at the Peggy Slusser Memorial Philatelic Library, at the Postal History Foundation, 920 North First Avenue, Tucson, AZ 85719. The phone, email addresses, and other information may be found on the Foundation’s website.